It’s All a Blur is far from a blur when you consider the show’s theme does not really have much to do with temporality. 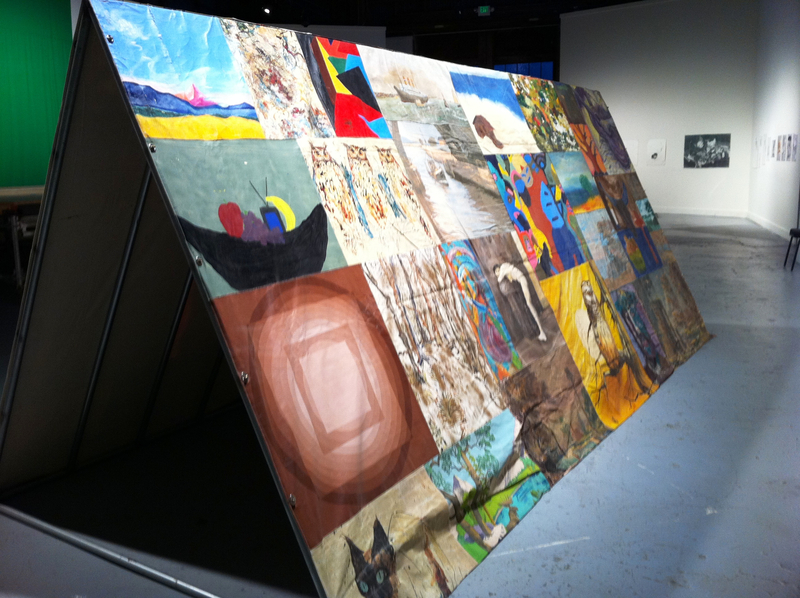 Walking through the exhibition is nothing like walking through a flurry of sales at the mall or a bustling city block. 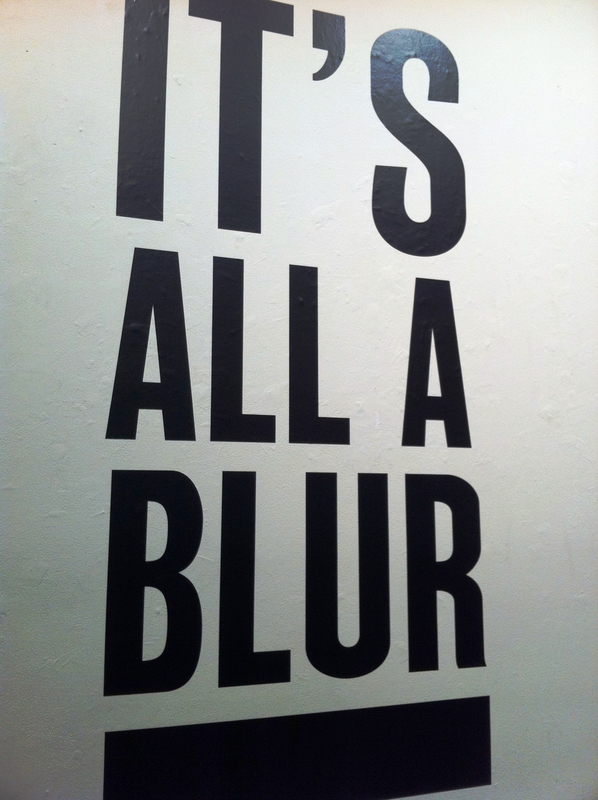 The Blur artists take what is often fuzzy in our lives and sharpens our focus. Each experience finds its way into the crevices of our subconscious. Individually, each work reconfigures and re-contextualizes American history and Western culture. Although the pieces are seemingly disparate, they investigate and, sometimes, muddle ideas such as labor, hybridism, non-mutuality, non-exclusivity, and absurdity. The varying forms presented in Blur may not draw immediate connections for the viewer (i.e., kitten drawings in the same space as a green screen live action performance piece where the patron is asked to become a part of the actual installation). Collectively though, the subject matter binds what is uncommon and makes them common under a thin shroud of Americana. The haziness of all the action settles into making each particular piece a work of art. Guillermo Gomez-Pena and La Pocha Nostra, Dale Hoyt, and Tony Labat amplify instances in American life and the gallery serves as the lens to look through and into the tightly wound fabric that binds a multitude of elements that create American and western culture. 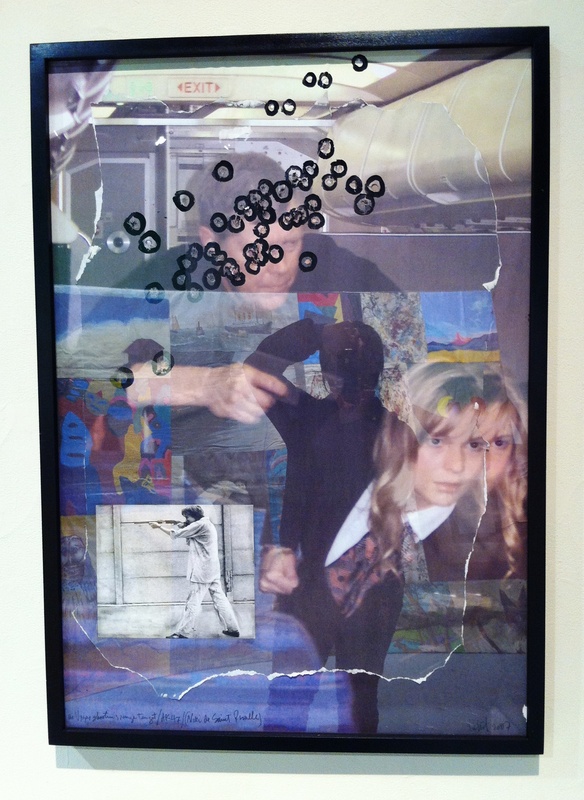 One of the more psychologically moving works was Tony Labat’s bullet laden piece titled, TIR (After Niki). It arrests your sense of security and the longer the gaze the more provocative it becomes to the baser part of human nature. The inability to look away, as much as you may want to. I was unable to do so. I returned multiple times to this particular piece during my visit. What exactly is the message Labat has for the viewer? How does the mind fathom and reconcile the implied actions? The suggestion of killing the pretty blonde woman coupled with looking at actual bullet holes circled by a permanent maker around the killer’s head is allegorical of the culture we find ourselves in. We witness a moment but within that moment, the viewer is seeing what the mind’s eye may be already doing – killing the perpetrator. Labat has done that for us. Or, has he? 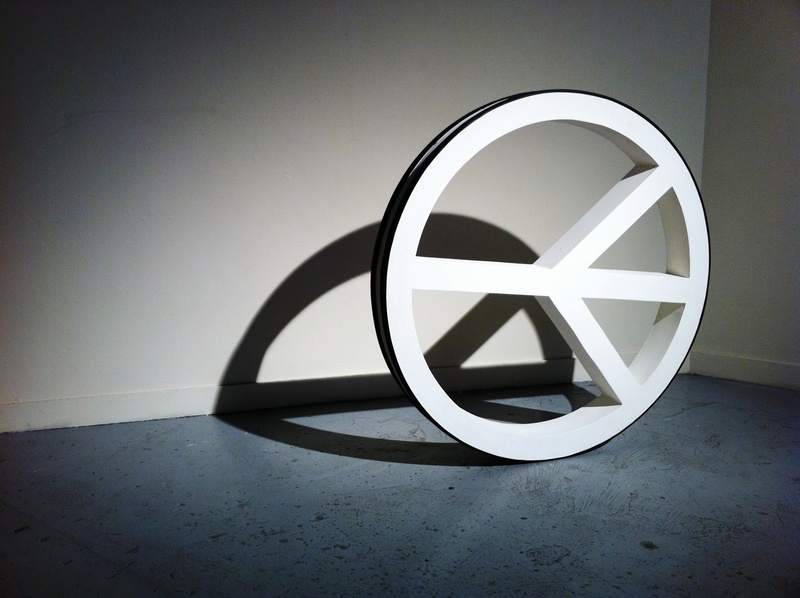 Peace Roll, another piece by Tony Labat is accompanied with a DVD loop. In the video installation, the viewer watches a woman walking through Golden Gate Park and various parts of San Francisco rolling a jumbo gigantic peace sign, which is actually a sculpture in the exhibition. I’ll provide a bit of scale here. I’m 5’1” and the sculpture, its diameter, is 7” taller than me. Although height doesn’t matter, I wanted to give you a bit of spatial context when imagining the sculpture. Aside from its obvious meaning, the footage was the most interesting aspect of the work. Watching the people watch this young woman rolling a peace sign all over the City reminds me of memory and what is memorable. Again, going back to the idea that the contents of this show are far from something fleeting, it is an act, a gesture that remains engrained another viewer within an environment. Talk about reverse psychology! What exactly is attainable in western culture? Labat looks at unattainability in ‘Leisure’. The simple act of grilling becomes laborious and far from leisurely. You may be wondering, ‘What exactly am I supposed to glean from this obscenely tall Webber?”. I’ll tell you. You need a job to make money to buy a home with a backyard to place a grill to cook for friends and family and it must be a Webber. Repeat (maybe). A Bigger house. A Bigger grill. (Repeat). This can go on ad infinitum, really. It’s not too dissimilar to an individual going to their local Best Buy store to purchase a large screen HD television only to find out you pay a delivery fee, an extra warranty fee on top of the actual manufacturer warranty just in case it becomes damaged or stolen. Then, you realize, there’s no space for your television! 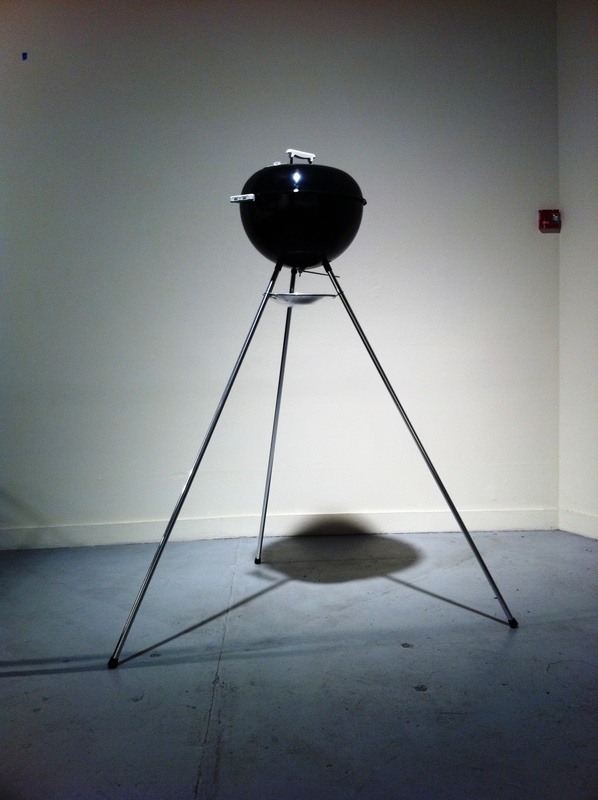 I looked at this piece quite humorously considering I’m a vegetarian and not very into grilling much of anything but if I were, would I stand in yet another long line of people wanting the matching ladder that comes with the grill? Instant gratification in this culture is rampant and a blur. Yet a consumer is willing to do whatever it takes to have the leisure and the luxury without much thought of the energy expended. It’s not so often that we see graphite drawings much less collaborative works. Dale Hoyt and Steve Thurston’s Kitten drawings present an array of all the things we may love and hate about cats. A combination of innocence and repugnance mingle and surfaces in these drawings. To be clear, these are not exquisite corpse drawings either. The markings are deliberate and some modified to shoo away comfort and thoughts of ‘cuteness’. 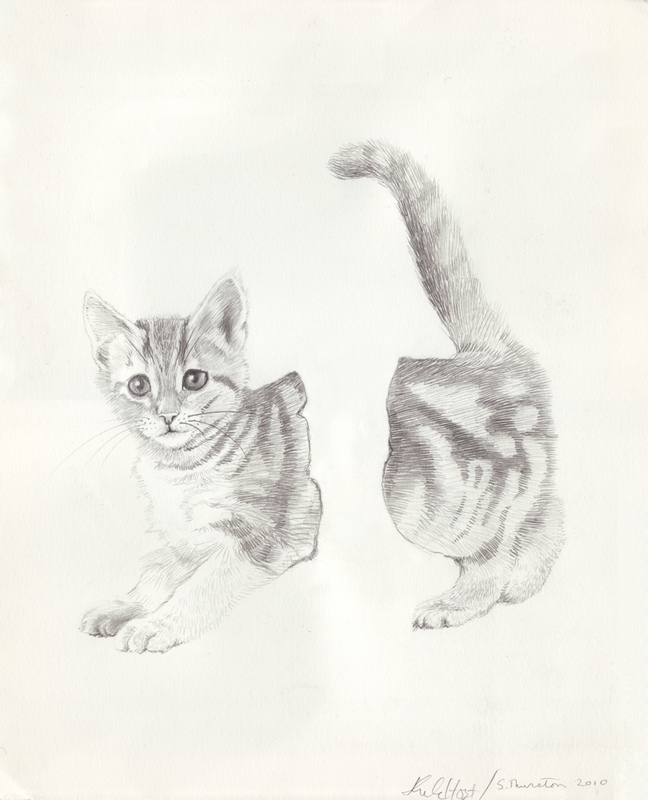 Being a lover of animals, I found myself transfixed by the kittens’ slight aberrations and brought back in by the gestalt effect (with the artist purposefully negating a portion of the body, as seen in Whole-listic). Humans idealize and romanticize all the time. With Kittens Kollaboration, the Hoyt and Thurston take the liberty of presenting difference to slow the quick gaze. Guillermo Gomez-Pena and La Pocha Nostra video installations located within a room off to the side of the main gallery was my last stop. 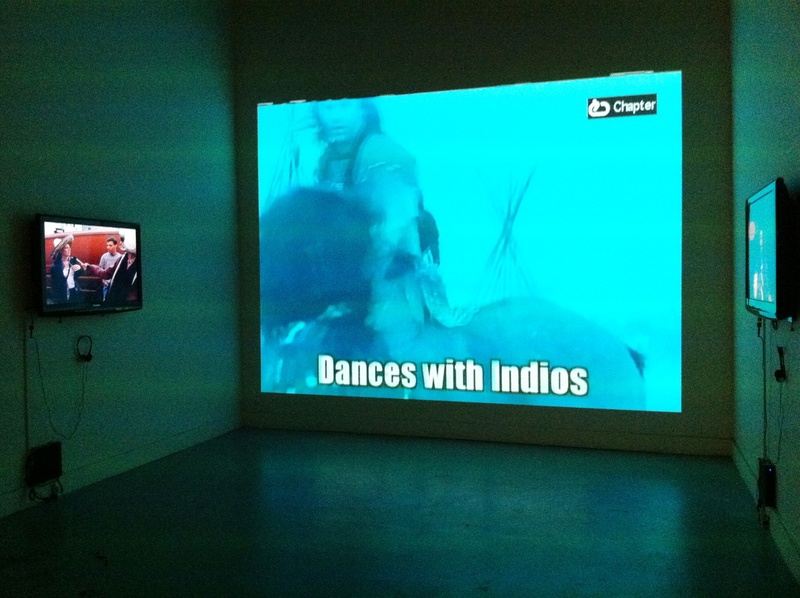 It involved watching a pastiche of vintage and semi-contemporary movie clips that provide the viewer with American perceptions of Latin American/Mexican culture. Nestled to the sides of the larger screen, you are bombarded with impromptu interviews with people on the San Francisco streets being asked to imitate a Mexican or an uptight ‘white’ person (sometimes, for money since many people will all of a sudden become gregarious for a buck and some incentive). The long-lasting effect is on the exhibition patron – the viewer. What exactly does the viewer get from this experience? Besides a cringe worthy moment, there is a sheath of embarrassment in the not so random act being a witness to this social experiment and performance. Ironically, it may have been a blur to the individual asked to participate but not to the person on the receiving end of the message. The gallery patron is left with someone’s knowledge and or experience, which in many cases causes discomfort. Posted in Art, Art and Technology, Digital Art, Film, Multi Media, Performance and Conceptual, Photography, Post Modernism, Visual Arts and tagged as Art, art community, art writing, artspeak, bay area, collaborators, conceptual art, drawing, justin hoover, performance art, postaday2011, San Francisco Art Institute, somarts cultural center, writing. Lovely piece – well written and your knowledge and enthusiasm comes across without gushing or sneering. It’s not easy to maintain a neutral tone while remaining interesting. Nuff respek. Thank you, Bug Lugg! 🙂 You definitely made my day and thankful for the feedback! 🙂 You and the Mrs should check out an upcoming performance piece at the SomArts Cultural Center this upcoming week. Let me know! This was the piece! Thanks for the kind words. About Tony Labat’s work, I SO wanted to move roll that peace sign out of the exhibition. One of my favorite sculptures/performance pieces! Thanks again!